Here is the Yahoo widget that I created . It’s my first Yahoo! Widget and it is for WordPress Blog Stats Monitoring. Basically it shows below six information of your WordPress blog. Optionally number of unique hits for today and yesterday only if wp-shorstat or wp-slimstat plugin is installed. The below image is the About menu of the Widget. You do have Yahoo! Widget installed , right? You must have a WordPress Blog. You need to enable Akismet Spam Blocker plugin. In fact, you don’t have to enable it , but then you won’t be able to see the related statistics. Optionally, you might want to install wp-shortstat or wp-slimstat for hit counter. DockIcon Function Added for Yahoo! Widget Version 4. Akismet, Comment in moderation, Hit counts are displayed. 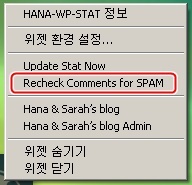 Download and double click the ‘hana-wp-stat.widget’ to open the widget. 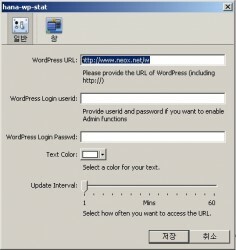 You will see the popup window to set the wordpress URL in the preferences menu. Open preference menu and provide the URL of your wordpress. Please make sure that you need to set the correct wordpress URL. The prefix ‘http://’ is needed, too. WordPress Userid & Password are required only if (1) you want to use the ‘Recheck comments for SPAM’ menu or (2) if you set ‘hana-xml-stat’ wp plugin option for only signed in user to access the data. By using Update Interval Slider , you can set the time period that the widget will acesss the statistics data. The default is 1 min, and the maximum value is 60 mins which is an hour. When there are some comments in moderation, you will be able to use ‘Recheck comments for Spam’ menu. ( Or little red ‘X’ icon ) What it really does is to check the comments with Akismet again. 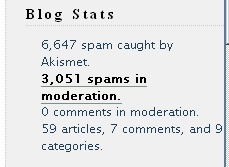 It is found that there is a time that some spams fall into the comments moderation section when the Akismet plugin timeouts connecting to Akismet spam server. It usaully happens when the network is slow and busy. So by just checking again, you can make sure that there is no spam lurking in your comments moderation box. Now Works with WordPress 2.3! I use Yahoo! Widget in my XP machine. One day, I tried to find this Yahoo! 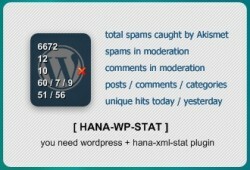 Widget that shows my blog’s general statistics(especially SPAM related) with maybe few extra admin functionalities. When I checked the widget.yahoo.com, there was only a single result,a widget showing only UNIQUE HITS. But that’s not good enough for me. When I searched the google.com, I was overwhelmed by the confusing results that were all about WordPress sidebar Widgets. So I decided to create a Yahoo! Widget & WordPress plugin. This plugin provides a XML feed access point and function that can be used in the template to show statistics summery. You can create a PHP script or a Yahoo! 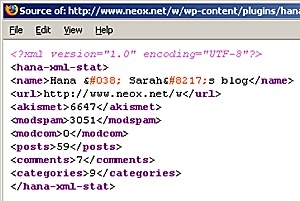 or even a Vista Widget to monitor your blogs through HANA-XML-STAT plugin. In fact, if you have multiple blogs to monitor, you can monitor several WordPress website from a single PHP script or Widget. Maybe, I will try to create one later on. Basically , this HANA-XML-STAT plugin shows six blog statistics. Additional hit counters are shown if you have wp-shortstat, wp-slimstat, or any derived plugin installed. You will be able to control the visibility of the first three items in the Admin Options Page. Also, you can allow only login user to view the status. Hit counters are added to show if wp-shotstat or wp-slimstat is installed. Initial creation. Six basic stats are shown in XML format. Activate the plugin through the ‘Plugins’ menu in WordPress Admin Interface. Place `<?php hana_xml_stat_side(“<li>”); ?>` in your templates. It takes two arguments. They are not mandatory, but the first argument is the prefix and the second argument is the postfix. Adjust settings in the ‘Options’ menu in the Admin Interface if you want to. The full URL is shown at the bottom of the Admin Optins Page. For example, if you WordPress URL is “www.yourblog.com/wordpress”, below would be your XML feed URL. This is the example output of the hana_xml_stat_side() function used in the sidebar.php of my current template. Here is a screen capture of the Yahoo Widget that I am currently working on. There are few admin functions that can work directly with WordPress without visiting the website. I will post this in this blog within few days. Sorry, I threw away this one.